New York, NY, April 17, 2017 — Henry David Thoreau (1817-1862) occupies a lofty place in American cultural history. He spent two years in a cabin by Walden Pond and a single night in jail, and out of those experiences grew two of this country’s most influential works: his book Walden and the essay known as “Civil Disobedience.” But his lifelong journal—more voluminous by far than his published writings—reveals a fuller, more intimate picture of a man of wide-ranging interests and a profound commitment to living responsibly and passionately. Now, in a major new exhibition entitled This Ever New Self: Thoreau and His Journal opening June 2 at the Morgan Library & Museum, nearly one hundred items have been brought together in the most comprehensive exhibition ever devoted to the author. Marking the 200th anniversary of his birth and organized in partnership with the Concord Museum in Thoreau’s hometown of Concord, Massachusetts, the show centers on the journal he kept throughout his life and its importance in understanding the essential Thoreau. More than twenty of Thoreau’s journal notebooks are shown along with letters and manuscripts, books from his library, pressed plants from his herbarium, and important personal artifacts. Also featured are the only two photographs for which he sat during his lifetime, shown together for the first time. The exhibition runs through September 10. The Morgan holds almost all of Thoreau’s surviving journal—forty simple volumes filled with the observations and reflections of a lifetime. Throughout the exhibition, his notebooks are paired with resonant objects—his flute with a journal entry about the importance of listening, his spyglass with an observation about birds he saw while peering through it, a bundle of nails from his cabin by Walden Pond alongside a notebook he used while living there. At the center of the gallery stands the simple green desk on which he wrote the thousands of pages of his journal over the course of a quarter century, convinced that a closely examined life would yield infinite riches. Thoreau entered Harvard College in 1833 at age sixteen and followed a traditional course of study based on rote memorization, recitation, and repetition. Though he is said to have complained that Harvard taught “all the branches” of learning but “none of the roots,” college was a transformative experience for him. His immersion in classical and modern languages, literature, and natural history set the course for a lifetime of self-directed reading and study. The exhibition features playful correspondence from Thoreau’s college classmates as well as student essays that contain hints of the big ideas that would continue to engage him, from the importance of simplicity to the value of independent thought. Thoreau read voraciously and in several languages, often with pen in hand, copying extracts into the same type of notebook in which he kept his journal. The exhibition includes a blank book he began using in college to copy selections from his reading. He devoted sixteen full pages to The Laws of Manu, an English translation of a classical Hindu text that influenced him profoundly. It is shown alongside Thoreau’s own copy of the Bhagavad-Gítá, another of his most cherished texts. Also on view are selections from Thoreau’s extensive self-directed study of indigenous North American cultures—a project that comprised some three thousand handwritten pages in a dozen notebooks. For Thoreau and many of his Concord contemporaries, a journal was the perfect venue in which to cultivate a dynamic, direct relationship with nature rather than relying only on books, teachers, elders, and religious authorities. He also famously committed himself to living responsibly and focused his thinking and writing on consumerism, materialism, individualism, spirituality, and what we now call environmentalism. Thoreau was a passionate abolitionist and sometimes provided assistance to African Americans who had escaped from slavery as they made their way to Canada via the Underground Railroad. He wrote almost nothing about these illegal activities in his journal. What he did express—at length—was his fury with a government that sanctioned an institution as heinous as slavery. In 1846, Thoreau spent a night in jail for failure to pay a tax in protest against state-sanctioned slavery. Out of that experience he developed his most influential essay, “Resistance to Civil Government” (later published as “Civil Disobedience”), which is shown in its first printed appearance alongside the lock salvaged from Thoreau’s jail cell. In the years that followed, Thoreau became the most outspoken public apologist for the militant abolitionist John Brown and turned again to his journal to rail against a government “that pretends to be Christian & crucifies a million Christs every day.” Many of these journal entries made their way, in revised form, into his fiery public speeches and published essays. As a young man, Thoreau wrote poetry, but he found his voice in prose. He published two books during his lifetime: A Week on the Concord and Merrimack Rivers, which did not cause much of a stir, and Walden, which most certainly did. Both of these works and others had their beginnings in his journal. In lectures and published works, Thoreau developed a first-person public voice designed to provoke, tease, stimulate, challenge, and, sometimes, entertain. In his private writings, he let his words flow more naturally, expressing surprise, anger, frustration, awe, joy, and even ecstasy. In his early notebooks, he often extracted pages and repurposed the text. Later, though, he left the volumes intact. Over time, the journal became his most essential work of art. Did Thoreau intend his journal to be read by the public? He repurposed and revised many passages during his lifetime and shared them in lectures and published writings. At the same time, the enterprise was deeply personal. “Says I to my-self should be the motto of my Journal,” he wrote in 1851. On view in the exhibition is his final entry, made in November 1861 after a violent rainstorm. He was paying attention, as he had done all his life, to ordinary details and seeing what conclusions he could draw. The second half of the notebook is empty. He died six months later. This Ever New Self: Thoreau and his Journal is organized by the Morgan Library & Museum, New York, and the Concord Museum, Concord, Massachusetts. The curator of the exhibition at the Morgan is Christine Nelson, Drue Heinz Curator of Literary and Historical Manuscripts, the Morgan Library & Museum. The curator of the exhibition at the Concord Museum is David Wood, Curator, the Concord Museum. The exhibition will travel to the Concord Museum, September 29, 2017-January 21, 2018. The exhibition is made possible with lead funding from an anonymous donor, generous support from the Gilder Foundation, and assistance from the Gladys Krieble Delmas Foundation. 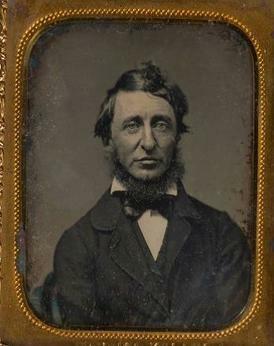 Image: Benjamin D. Maxham (1821-1889), Henry D. Thoreau, Daguerreotype, Worcester, Massachusetts, June 18, 1856. Berg Collection, New York Public Library.